With the 2018 season widely regarded as one of the most exciting in the series’ 15-year history, 2019 has all the ingredients for the most intense competition to date. And because nothing sits still, Formula DRIFT is welcoming new sponsors, drivers and cars to the series. There are six rookies in the 2019 Formula DRIFT Black Magic Pro Championship, for whom the O’Reilly Auto Parts Streets of Long Beach presented by Permatex would be their first competitive outing on the Californian street course. They include three drivers from overseas and three inductees from the Formula DRIFT Link ECU Pro 2 Championship. The top three from the drifting feeder championship are title winner Travis Reeder plus runners up Dylan Hughes and Sebastien Gauthier. The remaining drivers include Mitch Larner (Australia), who competed in 2018 Irish Drift Championship. This is a Formula DRIFT licensing partner, which enabled Larner access to the premier series. Manuel Vacca (Italy) and Joao Barion (Brazil) petitioned to join from non-associate series and were granted Pro competition licenses. The consequence of so many new faces is that the 2019 Formula DRIFT Black Magic Pro Championship just got more intense. In previous years, some of the top drivers might slip through the first elimination round with a bye run because other drivers failed to qualify or suffered mechanical problems. However, with a field of 37 drivers competing for 32 places at the first round, everybody has to stand up and be counted. 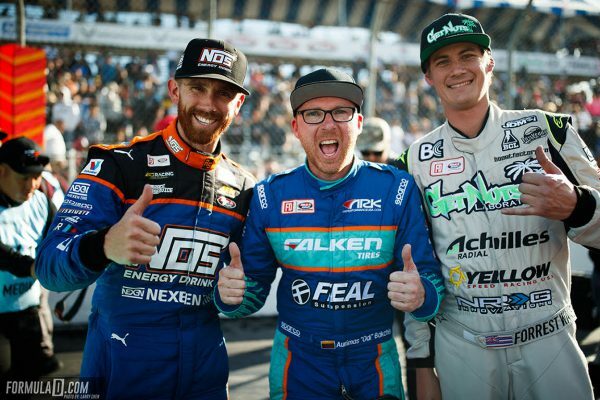 As if the previous five months hadn’t happened, the competitors in the 2019 Formula DRIFT Black Magic Pro Championship picked up almost exactly where they left off at the thrilling 2018 finale in Irwindale, CA. And while fans were undoubtedly hoping for a nail-biting qualifying session, few could have expected it would be decided by near-perfect runs. With drivers qualifying in the reverse order of their 2018 ranking, it would be the rookies who ran first. For most of them, track experience was limited to a handful of practice runs. As a result, there were several incomplete runs as they struggled to commit to the optimum line. Star of the new recruits was 2018 Formula DRIFT Link ECU Pro 2 Champion, Travis Reeder (USA). 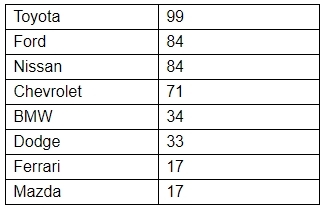 He scored a solid 84 points in his Nissan S13, temporarily placing him at the top of the table. His tally was increased by a single point on his second qualifying run, putting him in 19th overall. 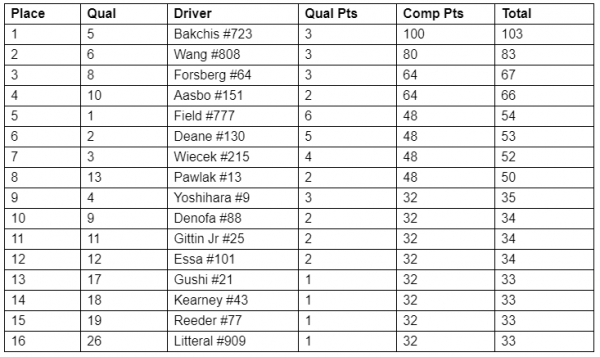 Things got crazy once we reached the top qualifiers (based on their 2018 finishing positions). Everybody wanted to ease themselves into the competition heats with a good qualifying run and after the smoke cleared, Matt Field (USA) claimed first place in the Borla / Falken Tire Chevrolet Corvette by virtue of a supremely well executed second run that was awarded 99 points by the judges. He held his breath as the top drivers then attempted to match his performance. Second place would fall to 2017 and 2018 FD Champion James Deane (Ireland) in the Worthouse / Falken Tire Nissan Silvia S15. He scored 98 points and as an indication of how hard everybody was trying, there were 15 drivers who scored more than 90 points. And while Piotr Wiecek (Poland) in the identical Worthouse / Falken Tire Nissan Silvia S15 placed third and 2011 Champion Daijiro Yoshihara (Japan) was fourth in the Turn 14 Distribution / Falken Tire Subaru BRZ, perhaps the biggest surprise from qualifying was 2015 FD Champion Fredric Aasbo in the Rockstar Energy Drink / Nexen Tire Toyota Corolla. Always a contender, he could only summon tenth position in qualifying. His driving appeared tentative from the sidelines but few would bet against him in Saturday’s heats. You need to go back to New Jersey 2017 to find the last time Aurimas “Odi” Bakchis (Lithuania) won a Formula DRIFT event. Always a force to be reckoned with, he’s spent five years as a Top 4 finisher, also recording single wins in 2016 and 2015. Starting early in 2019, only time will tell if he can build on the early championship lead he’s established. Having qualified fifth, Odi’s run to the Streets of Long Beach Final would see him line-up against Federico Sceriffo (Italy) in the Top 32. Despite Sceriffo’s relative lack of experience on the course, the FFF Drifting Department Ferrari 599 GTB Fiorano Drift Spec “Fiorella” is an imposing sight for any driver. For 2019, the twin superchargers had been removed from the Ferrari V12 engine, replaced with nitrous injection to get him the power needed to be competitive. Bakchis was in his familiar Falken Tire / Feal Suspension Nissan S14 and did enough to win the round. In the Sweet 16, Bakchis would face former Champion Essa, who was in fighting form, sacrificing his BMW’s rear bumper on his lead run in an attempt to drift as deep as possible in every turn. However, Bakchis was up to the challenge and put in a better chase run than Essa to get the nod from the judges. Moving onto the Great 8, Bakchis would have to defeat Justin “JTP” Pawlak (USA) in the Roush Performance / Falken Tire Ford Mustang. Wrapped in identical Falken team colors, Pawlak was in no mood to relinquish the round. Both men explored the track limits as they brushed from wall-to-wall in a perfect demonstration of the drifting art. After two runs the judges were unable to separate them so called for “One More Time,” where both runs would be repeated. At the second time of asking, neither driver relented. It would take a small mistake from Pawlak to tip the decision against him. Running hard through the first Touch & Go, the Roush Mustang made firm contact with the wall. It would push him offline and was enough to allow Bakchis to advance to the Final 4. In the semi-final he would need to vanquish the most successful driver in Formula DRIFT history: three-time Champion Chris Forsberg (USA) in the NOS Energy Drink / Nissan 370Z on Nexen Tires. After finishing fourth in the 2018 Formula DRIFT Black Magic Pro Championship, Forsberg had spent the off-season installing a Nissan GT-R VR engine and direct-port nitrous injection. the engine turned up a week before the first round and Forsberg was confident it would give him an extra advantage. And while both drivers put on a masterclass of drift skills for the sell-out crowd, the judge’s decision went to Bakchis by virtue of a superior chase run. In the Final, Odi would meet Forrest Wang in the Achilles Tires / Yellowspeed Racing / NRG Innovations Nissan S15. Wang had a similarly challenging path, which began when he faced Taylor Hull (USA) in the Top 32. Driving the Comp Cams / Achilles Tire Cadillac ATS-V, Hull is on an upward trajectory in the series after moving up from the Pro 2 category in 2017. Having qualified in 27th position, the smart money was on sixth-placed Wang who pushed hard to reach the Sweet 16, where he met 2010 FD Champion, Vaughn Gittin Jr in the Monster Energy / Nitto Tire Ford Mustang RTR Spec 5-D.
Gittin Jr is a renowned charger who never takes prisoners. On the first run he initiated hard but was forced to correct after Wang hit the wall and Gittin Jr struggled to regain his proximity to the lead car. On the second run, the judges gave the win to Wang as they determined he did a better job mimicking the lead driver’s moves. In the Great 8, Wang faced Piotr Wiecek. Generally regarded as one of the best drifters in the world for his speed and precision, their battle was hard-fought. Both drivers went wall-to-wall at a furious pace, carving wide lines through the course. With both runs completed, the crowd held its collective breath until Wang was adjudged the winner thanks again to a better chase run. He was tenaciously sticking close to the lead car, making him hard to beat. Having dispatched the third placed driver from 2018, Wang was confronted by second-placed Fredric Aasbo in the Final 4. While the 2015 Champion’s qualifying form seemed hesitant, he’d rekindled the fire and blazed through the heats, famously dispatching reigning Champion James Deane in the Great 8 as the Irishman struggled with nitrous injection issues. Facing such a formidable foe, and another fan favorite, Wang had a real challenge. This was reinforced on the first run where Wang struggled to string the turns together as Aasbo chased characteristically hard and fast, hitting the clipping points precisely. As Wang returned for the second run, Aasbo disappeared into the pits, his 2.7L Toyota four-cylinder turbo motor sounding gruff. After requesting a Competition Time-out, Papadakis Racing quickly diagnosed a terminal problem and gracefully withdrew from the competition. With many of the event favorites watching from the sidelines, Wang and Bakchis quickly warmed their tires and lined up for the Final. The crowd was in full voice, supporting the drivers at the top of their lungs as both committed to the course. As the smoke cleared, the judges ruled in favor of Bachkis, with Wang making small errors that were enough to separate the two. The 2019 Formula DRIFT series continues on April 25-27 in Orlando, FL with AutoZone Scorched presented by Black Magic. It will feature the second round of the Formula DRIFT Black Magic Pro Championship and the first round of the Formula DRIFT Link ECU Pro 2 Championship. Visit formulad.com for event details, ticket purchases, driver profiles and livestream information.